Last night was one of those nights: we had a crazy busy weekend, no time to get groceries, and I was left staring at my open fridge at 7pm trying to figure out what to do for dinner. Luckily, with the help of a few frozen veggies and pantry staples – I was able to create an amazing, elegant meal in less than 30 min. 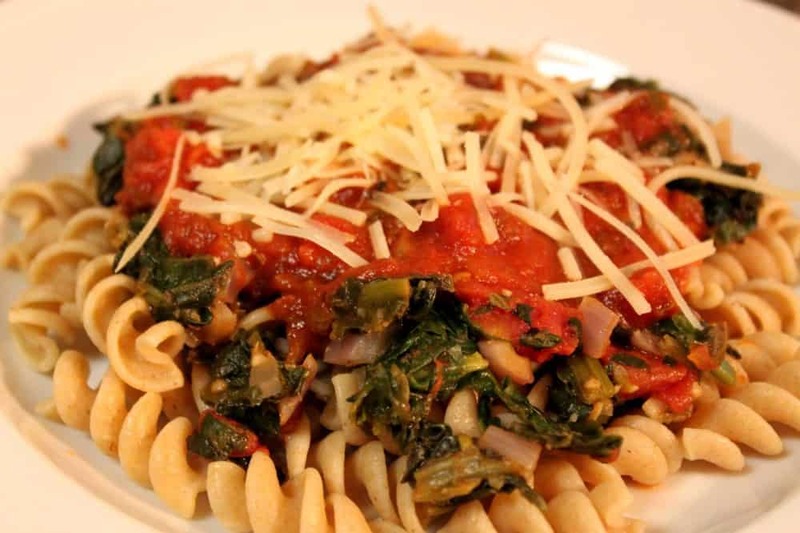 This dish is it’s super nutritious: with the spinach, red onions, garlic, tomatoes and whole wheat pasta providing fiber and antioxidants; and the cheese balancing out the meal with protein. It’s also budget friendly since most of the ingredients are frozen or canned. And time friendly too! Step 1: Cook the pasta according to package directions. 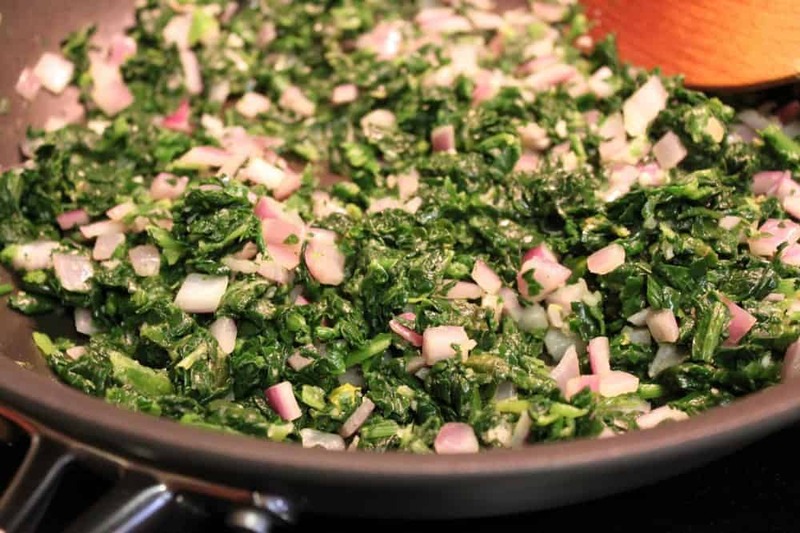 While the pasta is cooking, saute the onions, garlic and frozen spinach with 1 Tbsp EVOO in a large saucepan. Step 2: Once the pasta is cooked, drain and set aside. Once the spinach mixture is heated through, add 2/3 of the fire roasted tomatoes (add more if you want the pasta to be spicier). 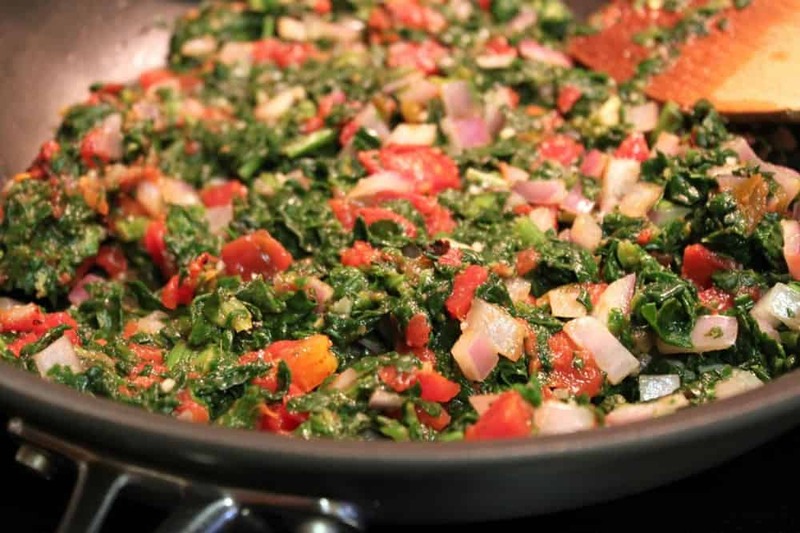 Step 3: Stir in salt, pepper, oregano into the spinach/tomato mixture – to taste. 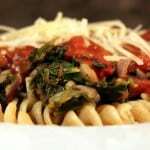 Heat up your pasta sauce and get ready to assemble/serve your dish! To assemble: Start with a layer of rotini pasta, top with veggie mixture, top with sauce, and finish off with 2 Tbsp grated fresh Parmesan cheese. I liked layering the pasta like this because it reminded me of lasagna (without the time intensiveness of making lasagna)! The husband was definitely happy with this dish – and I think the comfort-food quality helped to ease the pain of the Bulls losing Game 3 last night. Overall, not bad for a pantry meal! Frozen veggies and pantry staples come together in this fast pasta dish. 1 14 oz can fire roasted tomatoes with green chilies the green chilies add a wonderful spicy kick to the pasta – so try to use that instead of just plain fire roasted tomatoes! Cook the pasta according to package directions. While the pasta is cooking, saute the onions, garlic and frozen spinach with 1 Tbsp EVOO in a large saucepan. Once the pasta is cooked, drain and set aside. Once the spinach mixture is heated through, add 2/3 of the fire roasted tomatoes (add more if you want the pasta to be spicier). 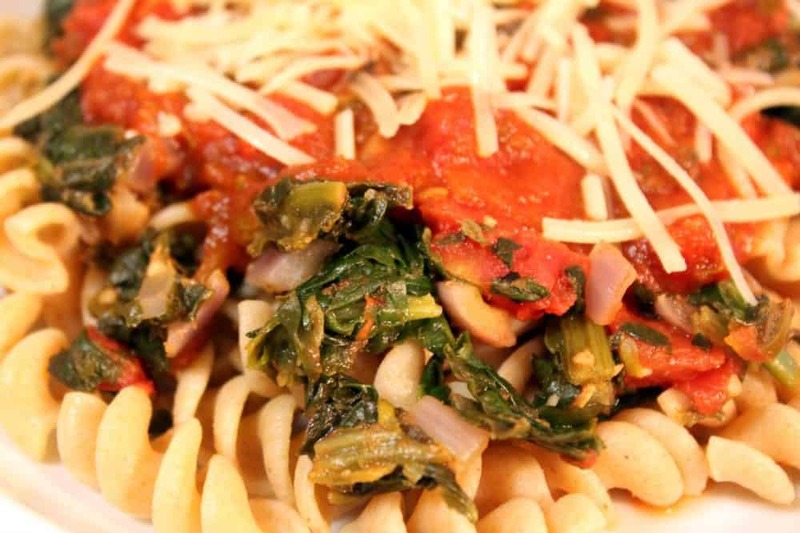 Stir in salt, pepper, oregano into the spinach/tomato mixture – to taste. 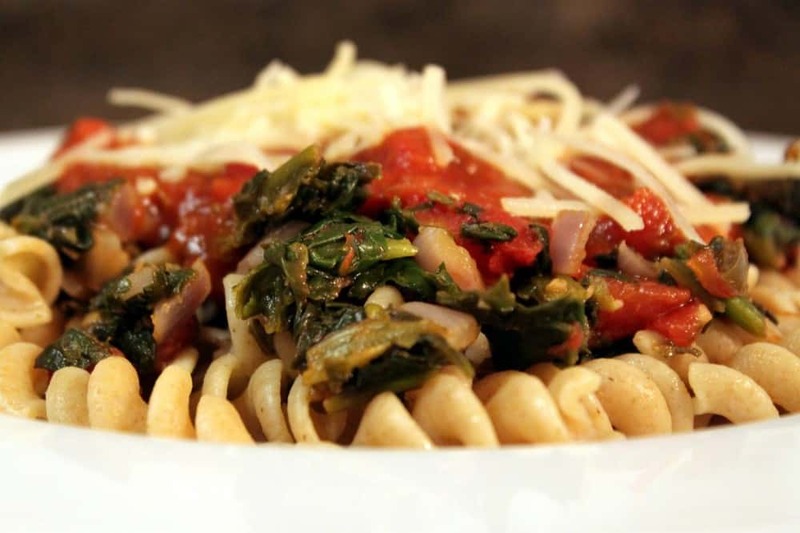 Heat up your pasta sauce and get ready to assemble/serve your dish! To assemble: Start with a layer of rotini pasta, top with veggie mixture, top with sauce, and finish off with 2 Tbsp grated fresh Parmesan cheese. Wow, this looks absolutely delicious. I recently started to eat healthy foods after I call a doctor which I found some useful information. I am trying to change my approach to how I view my foods, and keep it fresh! Thanks for the posts I love the site!! This dish looks like it would be packed with flavor and fill you up quick. Love spinach and peppers – and I may even be able to sneak some extra veggies into the BF without him noticing. Wonderful, wonderful, wonderful! I love the kinds of dinners when the ingredients are already in the cupboard, it pulls together quickly and it tastes like it’s been cooking all day, can’t wait to try it! Nicely done!!! You sure rocked the dinner in such a short time and got great photos to boot. You are amazing! I love it when a dinner comes together with what you have on hand and then it turns out to be something that you really like. Great job!! Love how fast this comes together. 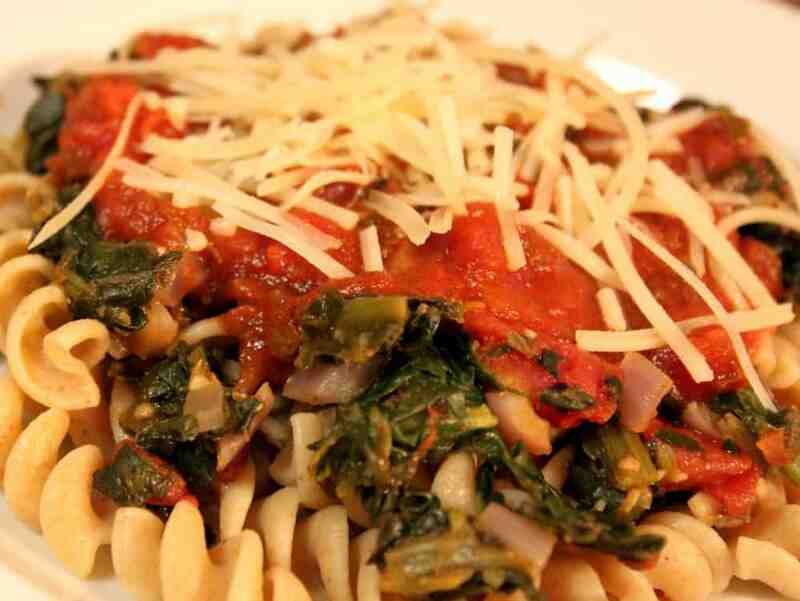 A healthy, quick pasta dish is great to have around!